Looking to serve roast beef at your next family dinner? This roast beef recipe is sure to win rave reviews. 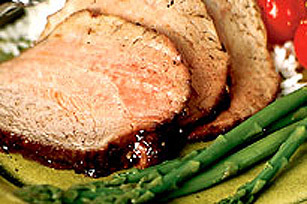 Coated with a teriyaki glaze, this top sirloin roast is effortless and elegant. COAT beef (2 lb top sirloin roast) in 1 pkg Shake'N Bake Teriyaki Glaze Coating Mix in a large plastic bag. Place in roasting pan and roast at 350°F for 60 minutes to internal temp of 170°F for medium rare. Larger or more well-done roasts may take a few minutes more. The Kraft Kitchens recommends you serve beef medium rare for tender; juicy and flavourful meat.